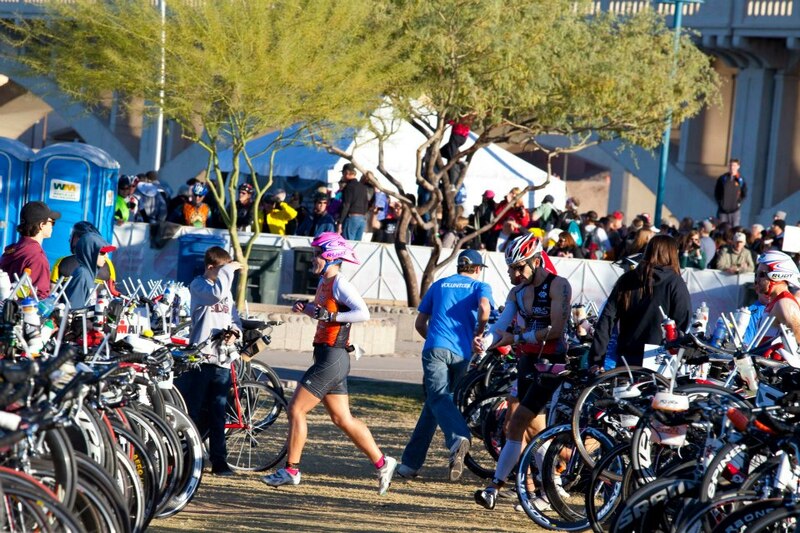 There's a reason I haven't posted in almost exactly one year - I was busy training for an Ironman. Seriously, for the better part of a year, I really didn't do anything else. And although that sounds kind of terrible, it was a great year. 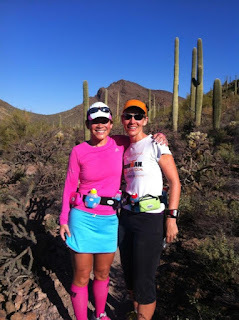 Shortly after we signed up for Ironman Arizona 2012, Shelly and I were invited by our coach, Dawn Elder, to attend Hillary Biscay's fabulous training camp in March. 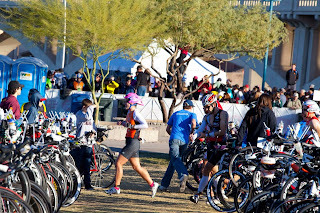 We trained for that and then we trained for the Tall Texan half ironman in late March, and then in April, Ironman Arizona training began. Dawn talked a lot about how this would be a journey, and I didn't realize how right she was. So the short story is that I didn't finish the race. I crashed out on the bike about 72 miles in. I can throw a bunch of blame at the guy who tipped me over and sent us sliding across the asphalt, but I'm not really that bitter about it (which is weird, because I can really hold a grudge). How do I feel about not getting the opportunity to complete my first attempt at the full iron distance - I think "bummed" might not be a strong enough word to use, but I'm not as devastated as I might have imagined. The truth is, I never imagined it. It just wasn't in the realm of possibility that I wouldn't complete this race. I figured that whatever happened, I'd finish - maybe slowly - but I'd finish. But then I didn't. I spent the summer training with Shelly and 2 other friends, Orissa and Herb (aka the Iron Whiners). We grew to be good friends through all the long hours we spent training together, and we made plans to stay in the same hotel and do all the pre- and post-race activities together. We arrived in Tempe late on Thursday night. To anyone considering driving from Texas - I recommend against it! It was a long drive to do in one day, and as soon as we arrived we all agreed that we would break the return trip into 2 days. If I had it to do again, I would fly. Robert will say he told me so! Despite the unreasonably noisy window unit air conditioner in our room that, when it kicked on, was loud enough to drown out the planes flying overhead (do not stay at the Tempe Hyatt Place for these 2 reasons), I managed to get about 5 hours of sleep the night before the race and was up and ready to go at 4 am on race morning. 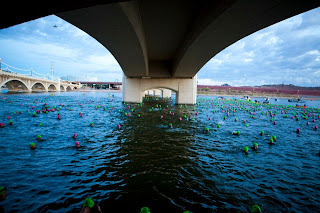 Our usual pre-race routine went smoothly and Shelly, Orissa and I were standing on the side of Tempe Town Lake ready to jump in. Coachie's recommendation to keep shoes on until the last minute was a good one - although I lost a perfectly good pair of flip flops and socks that day, my feet stayed warm until we jumped into the water. Even though the announcer repeated "Jump in and swim away. Don't jump onto anyone else," a thousand times as we were standing in line, as soon as I jumped in, a guy jumped on top of me, landing on my legs. And although he apologized, it shook me because I was already nervous about the contact of the mass start swim. This cold-water, mass start swim has been the single most stressful thing I've thought about all year leading up to this race. I just remember so clearly how cold everyone looked, and how scared many of their faces were, when we volunteered last year. Those images stayed with me for a year. And even though I had a great practice swim the day before (in a fabulous wetsuit borrowed from my lovely friend Aixa), I was not feeling confident about this swim. I know I can swim. But I was feeling very intimidated by all the talk of the Ironman washing machine. Shelly, Orissa and I made our way through the swimmers to the middle and front of the pack, about 5 rows back, as instructed by Dawn. The water was cold (64 degrees) and I couldn't help thinking about the Titanic. I was feeling bummed that we'd never seen Herb that morning. And then the cannon went off for the pro female start, and everyone around us went crazy! For a second, I thought the race had started, because everyone was pushing and splashing and swimming around us. So we started too, and then we realized that they were just moving into position closer to the start line. As we moved into position again, just 5 minutes before the cannon would go off, Herb came swimming up! He joked that he had heard my voice a mile away. We screamed and hugged him and he complained about being drowned (whatever, Herb). We bobbed there together as Mike Reilly pumped up the crowd, the national anthem played, and the spectators looked down from the bridge. We wished each other luck and then the loudest cannon ever went off! The race started in a flurry of arms and legs and water and it was total chaos. The mass start was everything I expected and more. In the first 5 minutes, I was elbowed in the face so hard that my goggles filled with water. I found a kayak and held on while I straightened them. I asked if there was any blood on my face and the lifeguard said, "no blood, just swim" so I did. There was a great deal of contact for the first mile and a half of the swim. Lots of kicking and grabbing and elbowing. It was exhausting and annoying. I felt so slow but I refused to look at my watch. On the way out, the sun was starting to come up. We had been warned that it would be in our eyes, so we wouldn't be able to see, but the sun wasn't the problem - I couldn't see was because it was just too hard with the splashing. I just followed the bodies down the lake. The turn bouys were hectic, but after the turnaround, it settled down a lot. The sun was now to my left, and I could feel it on my face each time I breathed. Knowing where it should be in relationship to the starting bridge was the way that I sighted. About three quarters of the way through, I was able to think a little bit. I thought, holy crap, I'm almost done with this swim. I'm almost done with my first Ironman swim. And I started to enjoy myself for the first time since the cannon went off. Then the water got wild again as everyone was heading in to the last half mile. We rounded the final turn bouy and headed back to the dock. I could hear the announcing and the screaming crowd and music, and I was smiling while I swam with the sun on my face. It was the most amazing feeling. And then I was there! I looked up at the clock as I was pulled up the stairs by the (strong!) volunteer and it said 1:18 and I couldn't believe it. Not only had I survived the swim, I had done it in a time that I could be proud of! I just started laughing with sheer joy and started running for the wetsuit strippers, had my wetsuit stripped off by another very strong volunteer, and was on my way. I jumped into the stream of people running towards the gear bags, and heard the announcer say my name. I laughed and yelled "that's me!" and laughed all the way to my gear bag. I ran into the ladies changing tent and was immediately struck by the size of it. It was tiny! From outside, there was this appearance of an enormous circus-sized tent - that one must have been the men's tent. It makes sense because there are 3 times as many male competitors as female...but still. I solicited the help of a very quick and awesome volunteer who did everything for me except apply chamois cream (thank goodness). As she put my socks on for me, I realized that my feet were numb from cold. I pulled on my gloves and was on my way out the door to get my bike. Wooooo hoooooo! I saw Shelly as I was on my way out with my bike. I thought, oh my gosh, we really might do this race together! I ran a few steps past the mount line just to be safe, then rode out in the middle of the pack towards the 3-loop bike course. The sun was bright and warm as I headed up the road. I couldn't stop smiling and laughing. There are a few turns and then you're out on the Beeline highway for several miles until the turnaround. Shelly passed by after a few minutes and said hi. We leapfrogged each other for the first loop and a half. It was nice to have her nearby, although we were always a few riders apart. We even stopped for a restroom break together after the turnaround. Haha! The course was really crowded. At times we were sitting up riding in a pack with nowhere to go. I did my best to avoid drafting. I saw all kinds of crazy stuff. One guy on a road bike rode by, no hands, talking on his cell phone. Just chit chatting. Another guy rode by him and swore at him. I saw a guy crash his bike right into a cone and flip end over end for no apparent reason - he was going in a straight line and then, all of a sudden, was down. I saw a man passing a woman and screaming at her to keep right - which she already was - so she unleashed a string of expletives and he yelled right back at her. Dawn had warned me that guys would pass and then sit up, and they did, with just inches to spare, which forced me to sit up and slow down to avoid hitting their back wheel. When we rode back into town, the crowds were huge and loud...and crossing the street! It was stressful and felt dangerous. Our cheering squad hadn't made it back from breakfast before Shelly and I made it to the first turnaround in town, so we missed out on that. And then went back out to the Beeline for round 2. I ate my saltsticks like I was supposed to every hour, drank my Infinit, and grabbed waters from the aid stations. I felt like even though the course was crowded and there was no way to get into a rhythm, I was nailing the race. On the way back into town for the second time, I thought, this isn't that hard, and you're almost done with the bike. You'll get to run soon. This day is passing by too fast! Dawn was right...again. Training is hard so that racing can feel that way. I felt fantastic. Well, you know what happens next. I was passing a slower female rider at maybe 20 mph and a guy came up on my left to pass me. Before I even knew he was there, he veered into my space, we made contact, and both of us went down. Even when I knew it was too late, I was thinking maybe I can save this, but we went sliding into oncoming bike traffic and eventually ground to a halt with one final bounce of my head that jostled my poor Rudy helmet out of place. I saw the oncoming cyclists and leaped up to move myself and my bike out of the way. I started checking my bike to see if anything was damaged. As a spectator came running up asking if she can help, I asked her to help me put my chain back on. I needed to get back into the race! And then I looked at my leg. Right under my knee, I had a 2-inch cut that was already bleeding down my leg. It was big and puffy and round like a golf ball and open!!! and looked terrible and I thought, uh oh. Then the medics arrived. They checked me for a concussion and cleaned and bandaged my leg, told me I would need stitches, and asked if someone could take me to the hospital or if I wanted an ambulance to do so. I opted not to take an ambulance. As I sat on the side of the road and watched the race go by without me, a race official confirmed my DNF over the radio and I cried. And of course I cried a lot since then. I cried when I called Robert to tell him the news. I cried when the official was driving me and my bike (which is fine, thank goodness) back to transition and we saw Mom and Dad walking. I believe I can say that I Snot Bawled when I saw Coachie, who hugged me and told me that thank goodness it's all about the journey and not the destination, because nobody can take the journey away from you. As always, Coachie is right. This might have started out to be about a finish line, but it ended up being about a journey. The journey lasted for a whole year, and through it, I learned what my body is capable of. And it is AMAZING what I can do. I learned what happens when you put your heart into something and really allow yourself to believe in yourself. I got to meet and trust and depend on some of the most wonderful new friends. I will be forever grateful for this year's journey. But of course I also want that finish line. So I'm embarking on the next leg of the journey, and I can't wait to see what I find. 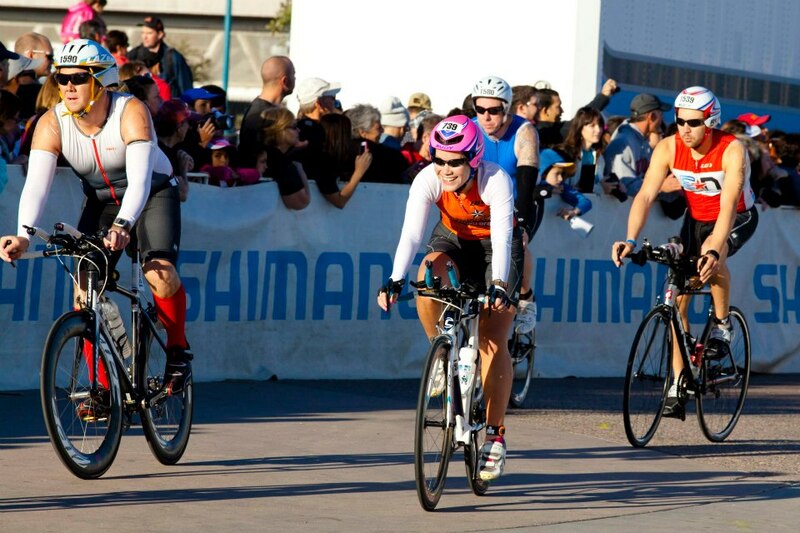 I registered for Ironman Texas (May 2013) as soon as I got home from Arizona. My ridiculous, crazy, wonderful friend Aixa, who repeatedly told me she wouldn't do a full Ironman "anytime soon," signed up to do the same race, so that I'd have someone to train with and she can take the journey too. I can't wait to get started (but I'm going to have to, because my leg is still healing). I want to say a heartfelt thank you to everyone who supported me in this year's journey. Robert, my amazing husband who sacrificed a lot this year for me to be able to do this, and who didn't bat an eye when I said I needed to keep going. Coach Dawn Elder, who helped me to believe in myself the way that I should. My awesome Iron Whiners: Shelly, Orissa and Herb, who made the journey so much fun, even on those hottest days of the summer - Congratulations to you all for CRUSHING your races at IMAZ. Aixa, who would always be up for a run or a swim or a bike at any random time of the day, and who I'll be spending a lot of time with in the coming months! The folks at Tri-Sition Area, who have supported my tri habit from the very first day. Matt and the guys at Bicycle Heaven, who through their constant giving of crap are always teaching and inspiring me to Go Faster. And my parents, family and friends who cheered and supported either at the race(s) or virtually, thank you!